A shocked 50 year old diabetic man in the emergency department presents after months of malaise and reduced exercise tolerance, and is hypotensive in the ED. His heart appears enlarged on a CXR, so you perform a brief bedside echo to assess biventricular size and function and look for the presence of pericardial fluid. PLAX: Dilated LV. 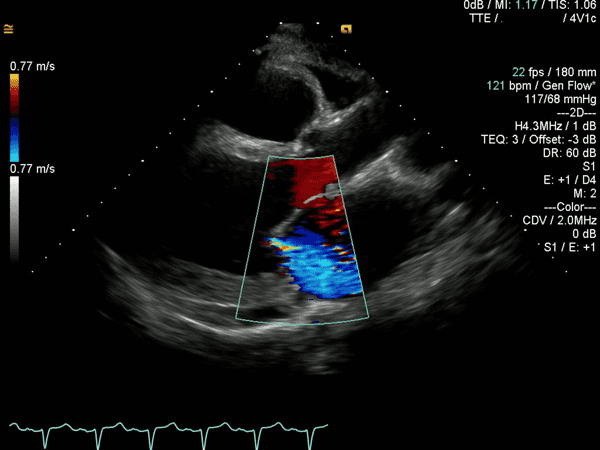 (>5.5cm); Severely reduced LV systolic function (walls should come in by 1/3); LA enlarged (should be approximately the same size as the RV and proximal aorta ~2cm); and small pericardial effusion (small <1cm, moderate 1-2cm, large >2cm). 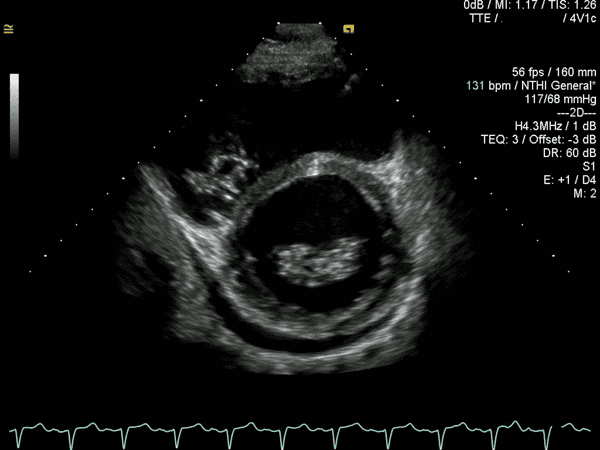 PSAX at mitral valve leaflets: Also see tricuspid valve en face here. 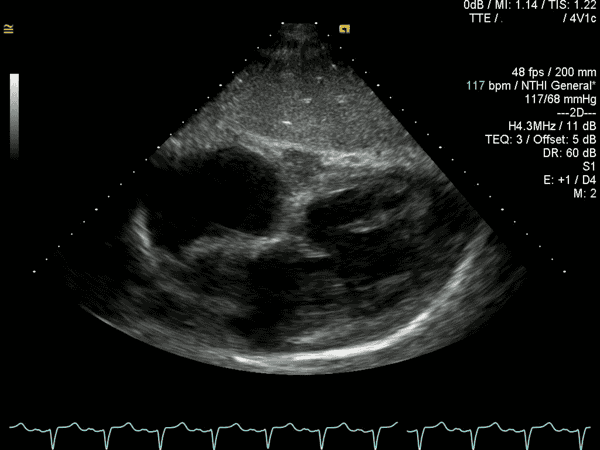 Small rim of pericardial fluid. 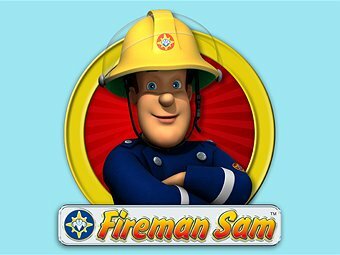 PSAX at midpap level: The LV is globally severely down but the septum doesn’t appear to move at all. 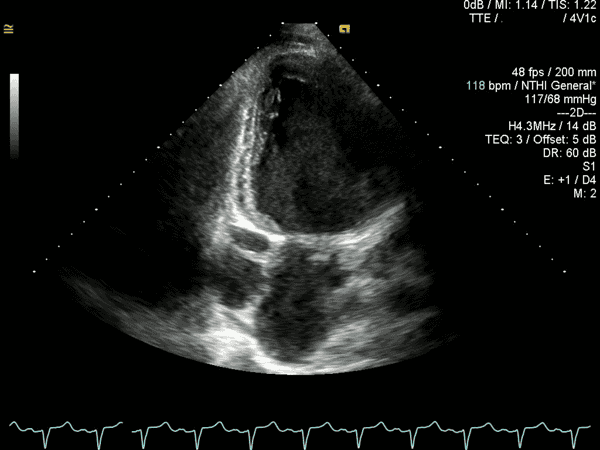 There is a small pericardial effusion and ?a pleural effusion. A4C: Akinetic septum. Overall severely reduced LV systolic function. Relative preservation of LV basal lateral wall and RV function. RV size normal. Tiny amount of pericardial fluid around RA. Dilated LA. A2C: LV systolic function severely reduced. Inferior wall practically akinetic. Anterior wall poorly visualized. 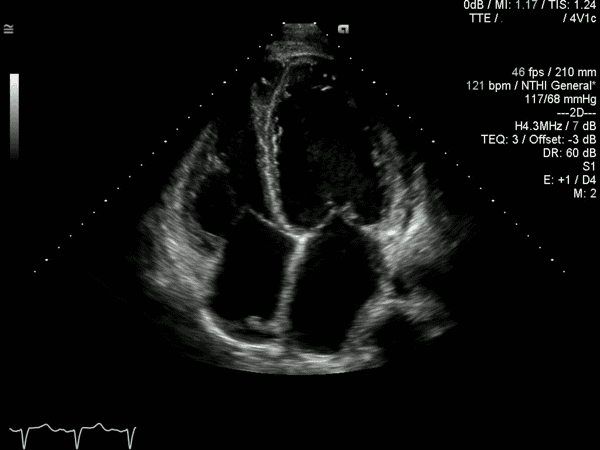 Left atrial appendage seen to the right of the LA, curling up towards the apex along the anterior wall of the LV, and in this view, free of clot – although TOE would be required to definitively exclude this. On the opposite side, the coronary sinus is seen at the level of the mitral annulus, and adjacent to that, the descending aorta. 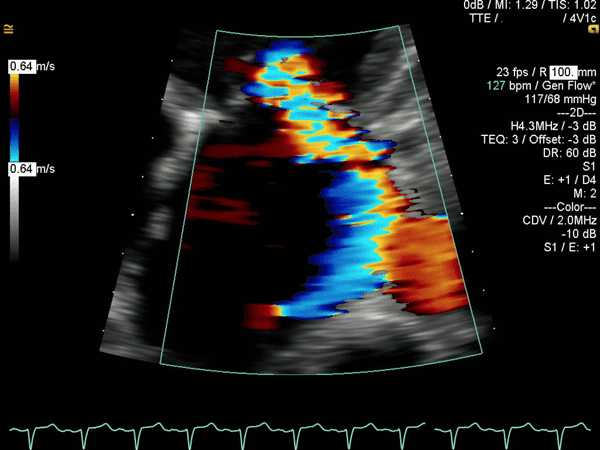 A2C zoomed on LV: inferior wall practically akinetic. Anterior wall better visualized here. 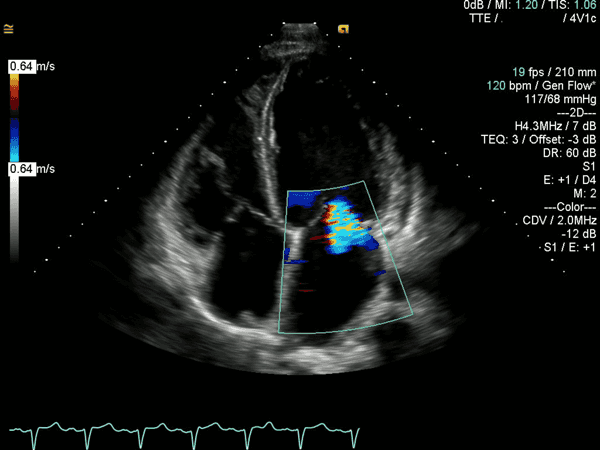 A3C Zoomed on LV: Overall severely reduced systolic function. 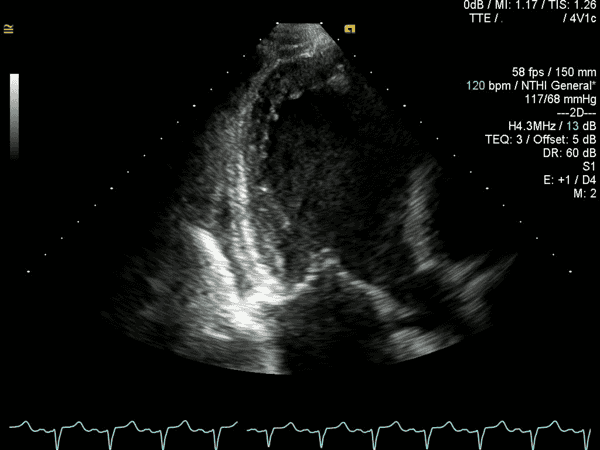 Inferolateral wall shows thickening at base (close to mitral valve) only. 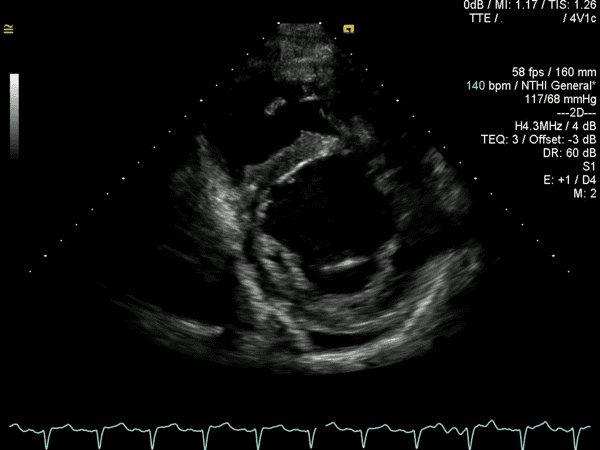 Anteromedial wall poorly visualized. If you remember that the left ventricular outflow tract is anterior and the septum is medial, it is simpler to work out all the walls. 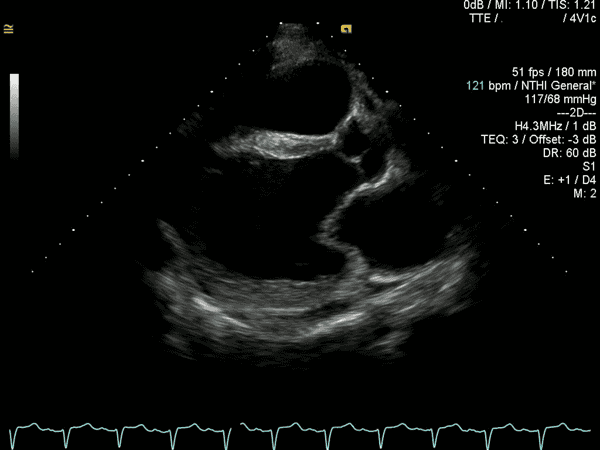 Subcostal 4 chamber: Severely dilated LV with severely reduced LV systolic function. Baddest heart in the whole damn town! 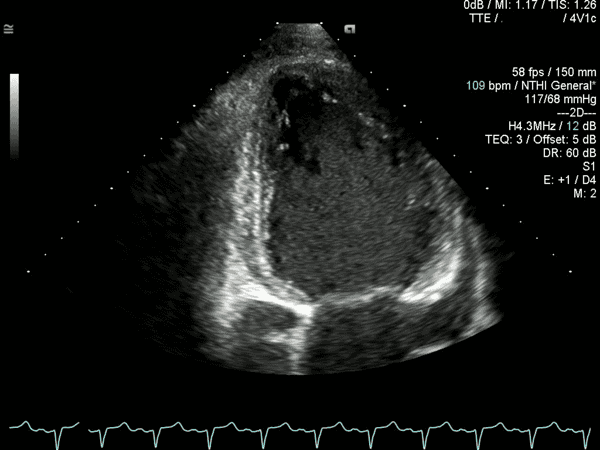 An overview of echocardiographic features for the diagnosis of infective endocarditis.